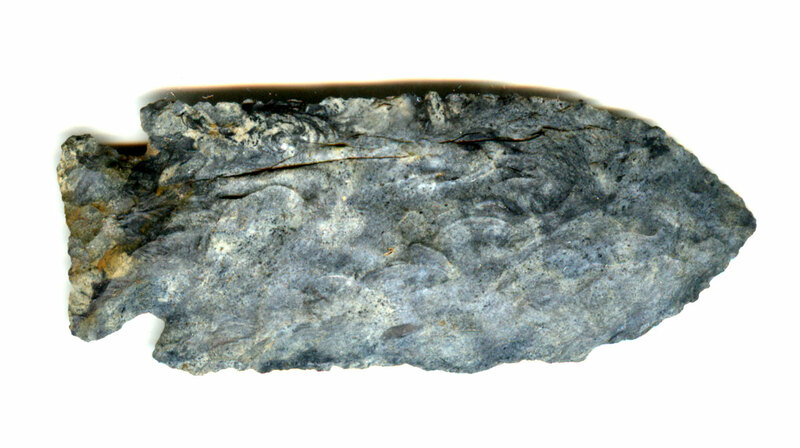 A Medium To Large, Colorful, Visibly Aged, Nicely Made Stilwell Point That Exhibits Surface Frosting And Stone Aging Coloration Patination, Correct Lightly Ground Basal Stem Edge Hafting Dulling, Aged Surface Mineral Deposits, Aging In The Corner Notches, Correct Style Of Blade Flaking, Correct Blade Sharpening Use Reduction, Correct Material And Manufacture For The Area Found. Ex-Horsefly Bush, Brandon Vandiver, Tony Putty And Jim Pribble Collections. Pictured In The Horsefly Bush Coshocton Frame. This Is A Highly Collectible, Well Documented Artifact Being In Good Condition! Includes Dwain Rogers And Ken Partain Certificates Of Authenticity. Includes Photo Of Stilwell In The Horsefly Bush Coshocton Frame.